What Is a Petition for Removal? When a couple decides to separate, one of the most contentious and emotional issues that comes up involves the care of their children. Because of this, parents and their children need experienced help to negotiate an arrangement that suits the child's needs and wishes, and those of both parents. Divorce can take a significant emotional toll on all involved, and a solid parenting plan can minimize the stress on both the child and the parents. The legal team at Nottage and Ward, LLP, has been helping Illinois residents protect their parental rights for over 25 years. Let us utilize our experience to get you the best child allocation arrangement possible. Call (312) 332-2915 for a consultation. What Are the Child Allocation Laws in Illinois? Under Illinois law, child allocation is broken into two parts: physical allocation and legal allocation. Physical allocation describes who the child lives with and sets a schedule for parenting time. One parent may be the residential parent; however, both parents have parenting time with the child. Legal allocation describes who has the right to make significant decisions for the child. These decisions include, but are not limited to, education, religion, extracurricular activities, and health. These decisions include where the child goes to school; when, where, and how he or she receives medical treatment; and other life-shaping decisions. Sole allocation allows only one parent to make these important decisions for the child while joint allocation assures that these decisions are made by both parents jointly. "... the strongest representation I could ask for in a very complicated, emotional matter. She has continuously looked out for my best interest and the best interest of my son." Under the Illinois Marriage and Dissolution of Marriage Act, a parenting plan is defined as: "a written agreement that allocates significant decision-making responsibilities, parenting time, or both.” Parenting plans establish the rights and duties of each parent in the care of their children. When the parents agree on these issues, a parenting plan can be drafted with the help of the attorneys that represent each parent, pending final approval by a judge. Once approved, a parenting plan becomes a court order that requires compliance from each parent. Changes to a parenting plan can only be made through legal modification. A parenting plan will outline the time the child spends at each home, how he or she will be transported, how school vacations and holidays will be shared, and how all of the significant parenting decisions will be made. First and foremost, what is in the child’s best interests. The child’s relationships with parents, siblings, or other parties that could impact the future happiness and stability of the child. The child’s relationship to the community, including home and school. Mental health of the child and parents. Issues associated with abuse or threats of abuse to the child. Issues associated with domestic violence. Whether each parent appears to be willing to encourage the relationship with the other parent. No one physical or legal parenting arrangement is right for every family or every situation. Your parenting plan must be tailored to your needs and your child's needs. The child allocation lawyers at Nottage and Ward, LLP, have seen, time and time again, how the challenges presented by parenting disputes can get acrimonious. We can help you avoid such a situation. In examining the specifics of your case, we will help devise a plan that ensures your child's best interests are accurately represented when allocation is being determined. If parents cannot agree on a parenting plan, formal negotiation during the settlement conference may be needed. At Nottage and Ward, LLP, our Illinois divorce lawyers are experienced negotiators who can help you and your spouse reach an accord even in a contentious case. Child allocation can often be worked out with you and your attorney presenting and defending your needs and interests in negotiation with your spouse and your spouse's attorney. Litigating child allocation in court is a last resort, but we are prepared to guide you through the process if need be. When only one parent has physical allocation, the parents or court may create a parenting time plan (formerly a “visitation” plan) to allow the non-allocated parent and the child to see one another. In most cases, a child should see his or her non-allocated parent as regularly as possible. This helps the child and non-allocated parent maintain an active relationship. Setting up a parenting time plan means considering several factors, and this process is not always easy. The child's age, needs, and desires require serious consideration. Other things that will affect scheduling include the parents' work schedules, the child's school schedule, activities, and where the child will spend the holidays. The relationship between the parents also has a profound impact on the drafting of a parenting time agreement. If the parents cannot agree, a formal negotiating process or mediation in court may be required. A non-allocated parent may be unable to be alone with the child for any number of reasons. Illinois courts may restrict parenting time if it would seriously endanger the child's physical, mental, or emotional health, or impair his or her moral upbringing. Illinois courts focus on the child's welfare while seeking to provide as much safe parenting time as possible. Supervised parenting time may be required in these cases. Grandparents, great-grandparents, and siblings may also receive visitation time. Relatives seeking visitation should enlist the help of an experienced Illinois child allocation attorney to ensure their rights are respected. If the allocated parent wishes to move out of state, a Petition for Removal must be filed with the court. The non-allocated parent may wish to oppose the move. Whether you are seeking to move out of state or to prevent your child from being moved out of state, an experienced Chicago child allocation attorney can help you do what’s best for your child. The emotionally charged nature of a divorce and child allocation proceeding may prevent parents from agreeing on a parenting time plan for their child. In this case, an experienced Chicago allocation lawyer will stand up for the interests of client/parent, both in negotiations and in court. Nottage and Ward, LLP, has focused solely on divorce law for over twenty years. Our attorneys have the experience to make sure that your rights and needs are addressed during your divorce. To discuss your situation with an experienced lawyer, schedule your initial consultation today by calling (312) 332-2915. 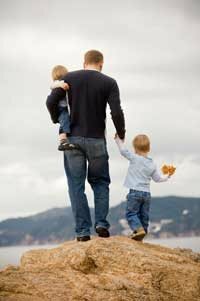 Chicago Child Custody Attorney Disclaimer: The legal information presented at this site should not be construed to be formal legal advice, nor the formation of a lawyer or attorney client relationship. Any results set forth herein are based upon the facts of that particular case and do not represent a promise or guarantee. Please contact an attorney for a consultation on your particular legal matter. This web site is not intended to solicit clients for matters outside of the state of Illinois.